determine what key studies are required to increase the level of evidence supporting the recommendations. review of the integrated proceedings by all participants. Each recommendation is graded according to the strength of the scientific evidence supporting it (Table 1). However, we emphasize that these are general guidelines and that decisions should be made according to the individual patient's situation and condition. Asthma is characterized by paroxysmal or persistent symptoms such as dyspnea, chest tightness, wheezing, sputum production and cough, associated with variable airflow limitation and a variable degree of hyperresponsiveness of airways to endogenous or exogenous stimuli. Inflammation and its resultant effects on airway structure are considered to be the main mechanisms leading to the development and maintenance of asthma; therefore, the main thrust of asthma therapy is to limit exposure to triggering factors and to reduce the inflammatory process using anti-inflammatory agents. If needed, therapies to maintain optimal airway calibre and to control symptoms may be added to ensure acceptable asthma control and to improve quality of life. This requires individual assessment of the need for therapeutic intervention and establishment of the risks and benefits of various therapeutic choices (environmental measures, education and pharmacotherapy). Conference participants retained the concept of the asthma treatment continuum adopted at the 1995 Canadian Asthma Consensus Conference. This reflects a more dynamic therapeutic approach than stepped care, and it supports the adaptation of drug therapy to the individual patient according to the severity of the underlying illness and the degree of control achieved. Although, ideally, optimal control of asthma means the absence of respiratory symptoms, no need for a rescue bronchodilator and normal pulmonary function, this is may be difficult to achieve. Therefore, the participants preferred to base treatment needs on what they defined as "acceptable control" according to clinical and physiologic measures (Table 2). Acceptable control is achieved through appropriate environmental measures, proper education of patients and individual pharmacotherapy. It should be assessed regularly and treatment adjusted accordingly. The initial measure of the severity of asthma in a patient is based on the frequency and duration of respiratory symptoms and the degree of airflow limitation. Once asthma is well controlled, one of the best ways to judge severity is to determine the level of treatment needed to maintain acceptable control (Table 3 and Fig. 1). Indications of severe or poorly controlled asthma also include a prior near-fatal episode (loss of consciousness, need for intubation), recent admission to hospital or a visit to the emergency department; night-time symptoms; limitation of daily activities; the need for an inhaled β2-adrenoreceptor agonist (β2-agonist) several times a day or at night; and forced expiratory volume in one second (FEV1) or peak expiratory flow (PEF) below 60% of predicted value. Asthma severity may vary over time; it may also decrease after anti-inflammatory therapy and with age, especially in children. When control of asthma has been maintained for several weeks or months, an attempt should be made to reduce medication within the bounds of acceptable control. Fig. 1: Continuum of asthma management. Severity of asthma is ideally assessed by medication required to maintain asthma control. Environmental control and education should be instituted for all asthma patients. Very mild asthma is treated with short-acting β2-agonists, taken as needed. If β2-agonists are needed more than 3 times/week (excluding 1 dose/day before exercise), then inhaled glucocorticosteroids should be added at the minimum daily dose required to control the asthma. If asthma is not adequately controlled by moderate doses (500-1000 μg/d of beclomethasone or equivalent), additional therapy (including long-acting β2-agonists, leukotriene antagonists or, less often, other medications) should be considered. Severe asthma may require additional treatment with prednisone. additional therapy (e.g., long-acting β2-agonists, leukotriene-receptor antagonists [LTRAs], etc.) can be added to moderate doses of glucocorticosteroids if acceptable asthma control is not obtained. Each treatment should be considered as a therapeutic trial, and its benefit carefully assessed in terms of its impact on symptoms and lung function. Medications used to treat asthma may be divided into 2 main categories: controllers and relievers (Table 7). Relievers are best represented by the short-acting β2-agonists. These quick-acting bronchodilators are used to relieve acute intercurrent asthma symptoms, only on demand and at the minimum required dose and frequency. Inhaled ipratropium bromide is less effective but is occasionally used as a reliever medication in patients intolerant of short-acting β2-agonists. Controllers (or preventers) include anti-inflammatory medications, such as inhaled (and oral) glucocorticosteroids, LTRAs and anti-allergic or "nonsteroidal" inhaled agents, such as cromoglycate and nedocromil. These agents are generally taken regularly to control asthma, although some patients, such as those with seasonal asthma, may need them only intermittently. Inhaled glucocorticosteroids are the most effective agents in this category and are considered the first-line anti-inflammatory therapy. The role of LTRAs during the initial anti-inflammatory treatment remains to be determined, but they can be used for this purpose in patients who will not or cannot use glucocorticosteroids. When inhaled glucocorticosteroids are insufficient; control of asthma symptoms may be achieved using additional therapy, such as the long-acting inhaled β2-agonists salmeterol and formoterol or the LTRAs zafirlukast and montelukast, as adjuncts. In a few patients, there may be a role for other bronchodilators such as theophylline and ipratropium. The β2-agonists and ipratropium do not diminish airway inflammation. There is some evidence that theophylline may have immunomodulatory effects, but the clinical significance of this remains to be demonstrated. Asthma drugs are preferably inhaled, because this route minimizes systemic absorption and, thus, improves the ratio of the therapeutic benefit to the potential side-effects. The patient must have repeated instruction on how to use the inhaled medication. The recently developed LTRAs have good safety and tolerance profiles and are taken orally, which may help certain patients comply with treatment. Asthma medications should be used at the lowest dose and frequency required to maintain acceptable asthma control; they should not be used as a substitute for proper control of the environment. Asthma medications are considered to be safe over many years when used appropriately. Long-term use of bronchial anti-inflammatory agents has not resulted in any clinically significant reduction in their efficacy. Recommendations apply to both adults and children unless otherwise indicated. Some repetition is unavoidable, but allows for emphasis of certain important points. The full set of references supporting the recommendations is included with the long version of the consensus guidelines. Physical examination is a poor indicator of the degree of airflow obstruction. Objective measurements are needed to confirm the diagnosis and to assess asthma control and the efficacy of therapy. In most patients, asthma is associated with atopy, and the relevance of common allergens to asthma should be assessed using both questionnaires and allergy tests (usually skin-prick tests). When young age or lack of cooperation prevent the performance of the necessary objective measurements, diagnosis and evaluation are necessarily based on the history and physical examination. Spirometry: A 12% (preferably 15%) or greater (at least 180 mL) improvement in FEV1 from the baseline 15 minutes after use of an inhaled short-acting β2-agonist, a 20% (250 mL) improvement after 10-14 days of inhaled glucocorticosteroid or ingested prednisone when symptoms are stable or a 20% (250 mL) or greater "spontaneous variability" is considered significant (level IV). Peak expiratory flow: When spirometry and methacholine testing are unavailable, variable airflow obstruction (i.e., ideally 20% or greater diurnal variability) can be documented by home-measured PEF (level II), although this measure is not as sensitive or reliable as FEV1. Airway hyperresponsiveness: Measurement of airway responsiveness to methacholine in specialized pulmonary function laboratories may help to diagnose asthma (level III). • Appropriate allergy assessment is warranted in patients with asthma (level III) and must be interpreted in light of the patient's history (level III). • The primary measure of asthma severity in the treated patient should be the minimum therapy required to achieve acceptable control (level III). The most common factors affecting asthma patients include allergens, respiratory irritants and viral infections. Allergens and irritants are encountered both outdoors and indoors. Outdoor air pollutants, such as respirable particulates, ground-level ozone and sulphur dioxide may exacerbate asthma. Indoors, irritants (particularly tobacco smoke) represent an even greater health risk. Intense efforts to avoid relevant allergens and irritants are clearly indicated. However, exercise should be encouraged, even if it triggers asthma symptoms as long as they are easily controlled with medication. In children viral and sometimes chlamydia or possibly mycoplasma infections can cause intermittent episodes of coughing and wheezing and subsequent persistent changes in airway function. In particular, respiratory syncytial virus is associated with bronchiolitis in infancy and recurrent bouts of wheezing. • Allergens to which a person is sensitized should be identified (level I). • A systematic program to eliminate, or at least substantially reduce, allergen exposure in sensitized people should be undertaken (level II). • Measures to control household dust mites can be effective in decreasing exposure and relieving asthma of patients sensitized to their allergens (level II). • Humidity in the home, including the bedroom, should be kept below 50% (level II). • Reduction of exposure to pet allergens cannot be effective without removing the pet from the home (level II). • Compliance with avoidance measures must be reviewed repeatedly and its importance emphasized (level III). • Increasing medication for asthma control should not be used as a substitute for avoidance of exposure to allergens and irritants (level III). • Exposure to environmental tobacco smoke should be avoided (level III). • Pregnant women and parents or caregivers of children with asthma should be particularly encouraged not to smoke (level II). • There is insufficient information to recommend the use of residential air cleaners and humidifiers (level III). • High concentrations of respiratory irritants should be avoided (level III). Asthma is the pulmonary disease most frequently associated with the workplace; therefore, it is important to identify this type of asthma to avoid progressive deterioration of respiratory function and even permanent disability. • Occupational asthma should be suspected and investigated in all adults with new-onset asthma (level II). • Once the diagnosis of occupational asthma has been confirmed, the patient should be removed from exposure to the causative substance (level III). • In industries associated with a high risk of occupational asthma, the level of exposure in the workplace should be reduced and regularly monitored (level IV). In the management of asthma, education of the patient is mandatory and should be aimed, primarily, at changing behaviour and improving self-management skills. Emphasis should be on preventive measures and rapid adjustment of treatment at the onset of asthma exacerbations. All people with asthma should be provided with an action plan and shown how to implement it in case of exacerbation. A multidisciplinary approach is preferable: education should be initiated by the physician and continued by other specialized health professionals. Patients with high asthma-associated morbidity should be given highest priority in terms of access to education. • Asthma education is an essential component of asthma therapy (level I). • The goal of asthma education is control of asthma via improved knowledge and change in behaviour (level III). • Asthma education should not rely on written or video-taped material alone (level I). • Asthma education is effective only in the presence of effective asthma therapy (level III). • Education must be provided at each patient contact (level II). • Good communication between health professionals and coordination of their interventions is essential (level III). • Patient self-monitoring may be effective using either measurement of PEF or monitoring of asthma symptoms (level I). • Monitoring PEF may be useful in some patients, particularly those who are poor perceivers of airflow obstruction (level III). • A written action plan for guided self-management, usually based on an evaluation of symptoms, must be provided for all patients (level II). • Monitoring of pulmonary function in physicians' offices should be routine (level III). • Patients with severe or poorly controlled asthma should be referred to an asthma expert (level II). • Immunotherapy is generally not recommended in the treatment of asthma (level IV). • Immunotherapy should not be used in place of avoidance of environmental allergens (level III). • Immunotherapy with clinically relevant allergens may be considered if disease activity is inadequately controlled by avoidance of the allergens and pharmacotherapy (level I). • Immunotherapy should be avoided while asthma is poorly controlled (level III). • Well-controlled asthma is not a contraindication for immunotherapy for allergic rhinoconjunctivitis or insect venom hypersensitivity (level III). • Immunotherapy must be administered only by trained personnel in centres where there is medical supervision and resuscitative equipment (level III). Inhaled glucocorticosteroids are the mainstay of asthma therapy and are clearly indicated in all but patients with the mildest disease. They are very effective in preventing persistent symptoms, improving lung function, decreasing airway hyperresponsiveness and reducing morbidity. Benefits are usually observed within a few days or weeks, and the greatest effect is usually observed within 3 months. Most of the therapeutic benefit is obtained at doses equivalent to 1000 μg/d or less of beclomethasone dipropionate administered using a metered-dose inhaler (MDI) with chlorofluorocarbons as propellant and a spacer device. There is an exponential increase in the risk of adverse effects at doses greater than the equivalent of 1000 μg/d of beclomethasone dipropionate (or lower in children). • Inhaled glucocorticosteroids offer the best option for the initial anti-inflammatory treatment of asthma (level I). • The initial daily dose in adults is commonly in the range of 400-1000 μg of beclomethasone dipropionate or the equivalent (Table 8); higher doses of inhaled or the addition of oral or systemic glucocorticosteroid may be required if the asthma is more severe (level III). • The initial daily dose of inhaled glucocorticosteroid in children should be 200-1000 μg of beclomethasone dipropionate or the equivalent; higher doses are rarely needed (level III). • Early initiation of treatment with inhaled glucocorticosteroids in the natural history of the disease is associated with a better functional outcome (level III). • Once best results are achieved, the dose should be reduced to determine the minimum required to maintain control (level III). This is especially true in children because they are more likely to have adverse effects but are also more likely to experience improvement or remission of their asthma (level III). • Loss of control of asthma should be treated as early as possible to prevent exacerbation from becoming severe (level III). The dose of glucocorticosteroid required and the duration of the increase in dose depends on the severity of the exacerbation. Inhaled glucocorticosteroids must be added or increased 2- to 4-fold (level IV), or prednisone at the dose of 0.5 to 1.0 mg/kg a day (level I) must be added if the exacerbation is severe. This increased level of glucocorticosteroids must be maintained until the best results are achieved and for a minimum of 10-14 days (level III). • Inhaled glucocorticosteroids at the low and moderate doses generally required to control symptoms in asthma infrequently exhibit clinically important side-effects and provide the best risk-benefit profile (level I). • Children who regularly require higher doses of inhaled corticosteroids (i.e., equivalent to 400 μg or more of beclomethasone dipropionate per day) should have their height measured regularly using a calibrated stadiometer (level IV). A change in growth velocity should lead to a reassessment of the therapy with emphasis on reducing glucocorticosteroid doses while maintaining adequate asthma control through environmental control and possibly the use of additional therapy. • People who use inhaled glucocorticosteroids regularly should be encouraged to rinse and expectorate after inhalation to reduce oropharyngeal deposition and systemic absorption (level I). • Physicians should frequently consider reducing the dose of inhaled glucocorticosteroid in patients who have achieved acceptable control of their asthma. Patients, whether children or adults, consistently requiring doses equivalent to more than 1000 μg/d of beclomethasone dipropionate to maintain acceptable control should be referred for specialized assessment (level IV). • In patients with a personal or family history of glaucoma, intraocular pressure should be measured within a few days of their commencing use of inhaled glucocorticosteroids, particularly if high doses are taken, and monitored at appropriate intervals (level IV). • Patients using a pressurized inhaler should avoid depositing any of the aerosolized glucocorticosteroid in the eye. A dry powder inhaler or spacer may prevent such an occurrence (level IV). • Bone densitometry is recommended in adult patients who require the equivalent of more than 1000 μg/d of beclomethasone dipropionate to maintain acceptable control or who have one or more risk factors for osteoporosis (level III). Short-acting β2-agonists remain the drugs of choice for the relief of acute asthma symptoms. They are most useful as a rescue medication to be taken as needed. Use of frequent or high doses of short-acting β2-agonists for chronic maintenance therapy may result in long-term decreased control of asthma and, possibly, increased morbidity and mortality. • Short-acting inhaled β2-agonists are the drugs of choice in both adults and children for relief of acute symptoms and short-term prevention of exercise-induced bronchospasm (level I). • When daily use of short-acting inhaled β2-agonist is needed, an anti-inflammatory medication is required (level I). • Regular anti-inflammatory medication should be used if short-acting β2-agonists are used more than 3 times a week in addition to their once daily use to prevent exercise-induced symptoms (level IV). • Patients who need a short-acting β2-agonist several times a day require urgent reassessment with a view to increasing anti-inflammatory therapy (level III). Because the benefit obtained with high doses of inhaled glucocorticosteroids is limited and the long-term potential for adverse effects is significant, it seems preferable to add other therapy to moderate doses of inhaled glucocorticosteroids when asthma control is not yet achieved. This will most often be in the form of inhaled long-acting β2-agonists or LTRAs. Some benefits may be obtained by adding a theophylline to moderate doses of inhaled glucocorticosteroids, but intolerance and the significant adverse effects that may occur with this medication are important limiting factors. • Inhaled long-acting β2-agonists (salmeterol and formoterol) may be considered as an alternative to increased doses of inhaled glucocorticosteroids and should be used as an add-on therapy to moderate or higher doses of inhaled glucocorticosteroids to achieve control of persistent asthma symptoms (level I). • Long-acting β2-agonists are not recommended for relief of acute symptoms or for use in the absence of inhaled anti-inflammatory therapy (level II). Because leukotrienes play a significant role in the inflammatory pathophysiology of asthma, LTRAs, or antileukotrienes, have recently been developed. Although these molecules are recognized for their inhibition of leukotriene-induced airway inflammation, their potential for modifying the natural evolution of the disease has yet to be confirmed. Without this evidence, the members of the consensus group believe that their use as monotherapy cannot be promoted in most circumstances. However, even though there are fewer studies on LTRAs than on long-acting β2-agonists, LTRAs may be used as add-on therapy to inhaled glucocorticosteroids. These agents have been shown to reduce exercise-induced asthma when used regularly and may be of particular benefit in patients with ASA-induced asthma although comparative studies with other drugs remain to be done. • LTRAs may be considered as an alternative to increased doses of inhaled glucocorticosteroids. LTRAs may be used as adjunct therapy to moderate or higher doses of inhaled glucocorticosteroids to achieve control of persistent asthma symptoms (level II). • There is insufficient evidence to recommend LTRAs as first-line anti-inflammatory therapy in place of inhaled glucocorticosteroids; however, for patients who cannot or will not use inhaled glucocorticosteroids, LTRAs should be the primary treatment choice (level IV). Disodium cromoglycate and nedocromil have been used less frequently in the treatment of asthma since other agents have become available. They are a less-efficient alternative to prevention of exercise-induced asthma than short-acting β2-agonists, and they can help to reduce allergen-induced responses following short-term exposures. • Disodium cromoglycate should not be added to an established regimen of inhaled or systemic glucocorticosteroids (level I). • Disodium cromoglycate may be used as a less-effective alternative to short-acting β2-agonist bronchodilators for the prevention of exertion-induced symptoms (level I). • In children with mild symptoms, disodium cromoglycate may be an alternative to low-dose inhaled glucocorticosteroids when the patient is unwilling to take inhaled glucocorticosteroids (level I). • Nedocromil is a safe but modestly effective alternative to low-dose inhaled glucocorticosteroid in children older than 12 years and in adults with mild asthma where the fear of side-effects preclude the use of glucocorticosteroids (level I). • Nedocromil may be considered as a less-effective alternative to short-acting β2-agonist bronchodilators for the prevention of exertion-induced bronchospasm (level I). • Ketotifen is not recommended in first-line therapy for asthma (level II). Although some reports suggest that theophylline has potential immunomodulatory effects, it is most often used as an alternative third-line agent; however, the incidence of side-effects is generally higher than that of other agents, even when low doses are used. • Theophylline should not be used as first-line therapy in children or adults with asthma (level I). • In patients whose symptoms do not respond to moderate-dose inhaled glucocorticosteroids alone, the addition of theophylline may result in asthma control that is equivalent to increasing to high-dose inhaled glucocorticosteroids alone (level II). • Theophylline may be useful in some children requiring high-dose inhaled glucocorticosteroids (level III). • Because theophylline has a narrow therapeutic range and potential for severe side-effects, the dose must be titrated to minimize side-effects in patients starting the drug, especially if high doses are required (level III). • Anticholinergic bronchodilators are not recommended as first-line agents. They may be used as relievers for patients who are unable to tolerate β2-adrenergic bronchodilators (level III). • In chronic severe asthma that seems unresponsive to moderate doses of oral glucocorticosteroids, confounding issues should be assessed before increasing the dose of oral glucocorticosteroids or using other immunosuppressive agents (level I). • Because of the associated clinical problems, patients with asthma who have a severe glucocorticosteroid dependence requiring further intervention should be referred to a specialized centre (level III). • Potentially toxic immunosuppressive agents, such as methotrexate, cyclosporine and gold salts, should be reserved for patients with severe asthma who are dependent on long-term high-dose oral glucocorticosteroids and should be used only in specialized centres (level III). • There is no objective evidence of any benefit, apart from placebo effect, from the more frequently used unconventional therapies such as acupuncture, chiropractic, homeopathy, naturopathy, osteopathy and herbal remedies (level I or III, depending on the therapy). For most children and adults with asthma, medications delivered via inhalation devices still represent the mainstay of therapy, especially for the acute relief of asthma symptoms. The benefits and side-effects related to the various inhaled medications depend specifically on the type of inhaler and their pulmonary deposition characteristics. The effectiveness of the inhalers depends heavily on appropriate inhalation technique. It is thus necessary to take into account the type of inhalation device used when medications are prescribed. More than 50% of patients use their inhalation devices inappropriately, reducing the effectiveness of their medication. • Inhaled drug delivery is recommended over oral or parenteral delivery for adrenergic bronchodilators and glucocorticosteroids (level I). • The inhalation device that best fits the needs of the individual patient should be chosen (level III). • With adequate teaching, adults and older children can use any of the commercially available hand-held inhalation devices. MDIs with spacers can be considered for all age groups, and specifically MDIs with valved spacer and face mask are advocated for young children and the elderly. Dry-powder inhalers can provide adequate drug delivery for most children by the time they reach age 5 years (level II). • MDIs that use hydrofluoroalkane propellant are recommended over those using chlorofluorocarbons (level IV). • Health care professionals must teach correct inhaler technique when devices are prescribed and dispensed (level I). • Patients' method of using their inhalation device must be reassessed and reinforced periodically (level II). • Asthma control should be reassessed when changing an aerosol device (level IV). • Wet nebulizers for home use are rarely indicated in the management of asthma at any age (level III). • A trial of wet nebulization in infants and children at home may be appropriate if an MDI with a spacer is not effective (level IV). • When spacers are used, conversion from a mask to a mouthpiece is strongly encouraged as soon as the age and the cooperation of the child permit (level II). • A diagnosis of asthma should be more widely considered in elderly patients with dyspnea, wheezing or nocturnal cough (level III). • Investigation to determine exposure to environmental and other asthma-inducing factors in elderly patients with recent-onset asthma should include a careful review of medications including self-prescribed ASA and other drugs with asthma-inducing potential (level II). • Special care should be taken to allow elderly patients with asthma to choose an inhaler device with which they are comfortable and competent (level III). • Measures should be taken to prevent osteoporosis in elderly patients with asthma who require prolonged treatment with oral corticosteroid (level I). • Elderly patients with asthma require careful follow-up because they have an increased risk of exacerbations, which may be related to impaired perception of their disease severity (level II). During pregnancy the severity of asthma often changes and patients require close follow-up and adjustment of medications. The use of inhaled asthma medications is not associated with any known adverse effects on the fetus, but uncontrolled asthma poses a substantial risk to both the mother and fetus. Specialists tend to prefer medications that have been used extensively and for long periods to reduce the potential of adverse effects to the fetus, especially during the first trimester of pregnancy. • Avoidance of allergic and nonallergic triggering factors should be the first form of therapy for asthma during pregnancy (level III). • The patient should be informed about the background risk of drugs in pregnancy in the general population. It should be made clear that, although relatively few medications have been proved harmful during pregnancy, no asthma or allergy medication can be considered to be proved safe (level II). • Physicians should discuss with the patient the possible consequences for the mother and fetus of inadequately controlled asthma, including the impact on maternal and fetal morbidity and mortality (level II). • Physicians should discuss medication choices and the rationale for the treatment plan; they should emphasize that the treatment is considered to entail less risk than the uncontrolled illness that could result in its absence (level II). • Treatment should take the same stepped approach as in the nonpregnant patient and may include inhaled β2-agonists, inhaled corticosteroids, ipratropium bromide, cromolyn and systemic glucocorticosteroids. Theophylline may increase nausea and reflux and is less desirable. There is significantly less information about the effects of the long-acting β2-agonists and the leukotriene inhibitors, and there is less clinical experience with these drugs than with other classes of drugs. These drugs should be used only for patients whose asthma cannot be controlled using the more studied therapies (level II). • The use of systemic glucocorticosteroids for severe asthma, especially for prolonged periods, may be associated with a greater risk of pre-eclampsia, antepartum or postpartum hemorrhage, low birth weight, preterm birth and hyperbilirubinemia (level II). • Patients requiring systemic glucocorticosteroid therapy should be considered to be in a higher risk pregnancy (level II). • Physicians should address all of the patient's questions and obtain and document the patient's concurrence with the therapeutic decisions (level IV). • Physicians should monitor and support the patient and other health professionals with respect to asthma management during the pregnancy (level IV). The management of exacerbations of asthma requires rapid access to facilities and personnel capable of delivering the medication appropriately, defining the severity of the asthma episode objectively, ensuring appropriate monitoring of oxygen delivery and instituting safe referral and disposition. Bronchodilators should be titrated using clinical and objective measurements and systemic glucocorticosteroids should be given to almost all patients who require a visit to the emergency department because of exacerbation of asthma. In addition to relief of symptoms and improvement in objective measures of airflow, a detailed review of risk factors for severe asthma is needed and an educational intervention offered. • A structured management plan should be used to treat patients with asthma in the emergency department (level III). • The severity of airflow limitation should be determined objectively using spirometry (the preferred method), PEF measures or both, before and after bronchodilator therapy (level III), unless the patient is too young (< 6 years), uncooperative or moribund. These measurements should not postpone necessary treatment (level IV). • The arterial oxygen saturation in (SaO2) should be measured before and after treatment (level III). • Supplemental oxygen should be used in treating patients with acute asthma to maintain SaO2 > 94% (level IV). • Short-acting β2-agonists should be considered the primary class of medication for the management of exacerbations. It should be administered by inhalation and titrated using objective and clinical measures of airflow obstruction as guides (level I). • The choice of delivery device (MDI with spacer, wet nebulization, dry powder) will depend on the need for expedient treatment, availability of staff and the individual patient of any age (level I). • The use of an MDI with a chamber (valved spacer device) is preferred over the use of a wet nebulizer for patients of all ages at all levels of severity (level I). • All patients treated in the emergency department for an acute episode of asthma should be considered candidates for systemic glucocorticosteroid therapy (oral or intravenous) and receive it as soon as possible (level I). • An anticholinergic drug should be added to β2-agonist therapy for severe acute asthma and β-blocker-induced bronchospasm and may also help in cases of moderate acute asthma (level I). • Aminophylline is not usually recommended for use as a bronchodilator in patients of any age during the first 4 hours of asthma management in the emergency department (level I). • Epinephrine (intramuscular or intravenous), salbutamol (intravenous) and inhaled anesthetics are recommended as alternatives to conventional therapy in unresponsive cases of life-threatening asthma (level II). • Intravenous magnesium sulfate (level I) and heliox (level III) may be useful in addition to usual therapy for refractory asthma. • Ketamine and succinylcholine are recommended for rapid-sequence intubation in cases of life-threatening asthma (level I). • Intubation should be performed by physicians experienced in this procedure (level IV). • Consideration for discharge should be based on results of spirometry (percent of previous best, or percent of predicted or absolute value) and assessment of clinical risk factors for relapse (level III). ♦ Patients with a pretreatment FEV1 or PEF below 25% of previous best level or the predicted value (i.e., FEV1 < 1.0 L or PEF < 100 L/min) usually require admission to hospital. ♦ Patients with a post-treatment FEV1 or PEF below 40% of previous best level or the predicted value (i.e., FEV1 < 1.6 L or PEF < 200 L/min) usually require admission to hospital. ♦ Patients with a post-treatment FEV1 or PEF between 40% and 60% of previous best level or predicted value (i.e., FEV1 = 1.6-2.1 L or PEF = 200-300 L/min) are possible candidates for discharge. ♦ Patients with a post-treatment FEV1 or PEF above 60% of previous best level or predicted value (i.e., FEV1 > 2.1 L or PEF > 300 L/min) are likely candidates for discharge. • Adults discharged from the emergency department who require glucocorticosteroid therapy should be given 30-60 mg/d of prednisone orally (or equivalent) for 7-14 days. No tapering is required over this period (level I). Children should receive 1-2 mg/kg a day of prednisone or equivalent (up to a maximum of 50 mg) for 3-5 days (level I). • Inhaled glucocorticosteroids are an integral component of asthma therapy and should be prescribed for almost all patients at discharge, including those receiving oral glucocorticosteroids (level I). • A treatment plan and clear instructions for follow-up should be given to patients discharged from the emergency department. Patients with high-risk factors, poor lung function or indications of chronic poor control should be referred to an asthma education clinic (level IV). Response to emergency treatment, clinical features that reflect the current attack and past disease severity, socioeconomic risk factors and pulmonary function tests are all used to determine the need for admission to hospital. Normally, patients over age 5 years who achieve 60%-70% of predicted or previous best lung function (measured by PEF or FEV1) do not require admission to hospital unless there is significant risk of relapse. Important factors that indicate a patient at high risk of relapse include: hospital admission or a visit to the emergency department in the previous 12 months; recent systemic glucocorticosteroid use; use of multiple categories of asthma medication; previous severe or life-threatening asthma attack; the presence of psychosocial problems; and the frequent, regular use of inhaled β2-agonists. The principles of inpatient management incorporate the spectrum of treatment options that are used in both the acute and long-term phases of asthma management. Opportunities exist to evaluate the need for education and a review of barriers to adherence to treatment plans. • All patients admitted to hospital for acute asthma should be given systemic glucocorticosteroids, preferably by the oral route (level I). • All patients should receive inhaled glucocorticosteroids in addition to systemic glucocorticoids (level IV). • Bronchodilators should be administered by the inhaled route and their need should be determined using objective measurements. The choice of delivery device (MDI with spacer, wet nebulization, dry-powder inhaler) will depend on the need for expedient treatment, the availability of staff and patient selection (level I). Rapid onset, the possibility of titration, reduced cost, more effective use of hospital staff, better side-effect profile and increased opportunities for education all make metered-dose or dry-powder inhalers preferable to nebulization in all age groups (level I). • Inhaled anticholinergics should be added to β2-agonist therapy for 24-48 hours in cases of severe asthma and possibly moderate asthma (level I). • Response to treatment and criteria for discharge should be based on serial pulmonary function studies and control of symptoms (level III). • Patients with severe airflow obstruction (FEV1 or PEF < 40% of previous best or predicted value following emergency treatment) or those who are hypercapnic, are unresponsive to treatment, deteriorating or have been intubated must have continuous care in the emergency department or a unit capable of frequent or continuous monitoring of oxygenation until their condition is stable or improved (level IV). • Supplemental oxygen guided by oximetry to achieve SaO2 > 94% is recommended (level IV). • Serial administration of arterial blood gases is recommended for critically ill patients and those with severe asthma if SaO2 is persistently low (< 90%) or if there is suspicion of hypercapnia (level IV). • Patient education, including a formal written action plan for treatment after discharge, should occur during the hospital stay (level I). • After discharge, patients should continue systemic glucocorticosteroids (30 to 60 mg/d for adults and 1 to 2 mg/kg per day for children) for at least 3-5 days in children and 7-10 days for adults (level I). • Patients should continue to take inhaled glucocorticosteroids after discharge with adjustment of the dose according to the action plan or on the advice of a physician at a follow-up visit (level I). • Follow-up arrangements with the primary care physician or asthma specialist must be made before discharge (level IV). • Patients with severe disease (FEV1 or PEF < 40% of previous best or predicted value post-treatment and/or frequent attacks) should be seen by a specialist during the hospital stay or as a follow-up after discharge (level IV). • Patients who have achieved more than 70% of predicted or previous best pulmonary function, who have access to the required medication, whose inhaled drug delivery technique is confirmed to be adequate and who have a written action plan can be discharged from hospital (level IV). There is evidence that many physicians and other care-givers do not know the treatment guidelines for asthma or integrate them into current practice. The Canadian Thoracic Society's Asthma Committee and all participants in the consensus conference have formed a committee to determine the best strategy for disseminating and implementing the recommendations included in this report. This should be done collaboratively at all levels of the health care system to reduce the gap between current practice and what is considered optimal care. • National guidelines should be adapted and implemented at a local level (level IV). This initiative could take the form of small-group problem-based workshops and case-based reviews, complemented by medical grand rounds. Workshops should focus on the practical day-to-day management issues, i.e., appropriate diagnosis, anti-inflammatory therapy, correct inhaler technique. • The use of a stamp in asthma patients' charts has been shown to improve asthma care compared with no such intervention (level I). • Key opinion leaders should be engaged to help promote asthma guidelines both as facilitators and as content experts for workshop programs (level IV). • There is a need for further controlled trials to define more clearly the optimum strategies for guideline implementation and to evaluate the impact of asthma guidelines on the management of asthma, especially the effect on patient outcome. Ongoing audit and re-evaluation by various stakeholders, e.g., college of family physicians, government health groups, may be particularly important (level IV). • A consortium of professional organizations, government, divisions of continuing medical education and industry should be encouraged to work together on implementing strategies to disseminate the recommendations. Industry, in particular, should be encouraged to collaborate in non-product-related programs that will make the best use of resources and prevent unnecessary duplication (level IV). We are grateful to all conference participants for their contribution to the consensus report and to the societies and sponsors for their support. Supporters: The Lung Association; 3M Pharmaceuticals; Astra Pharma Inc.; Boehringer Ingelheim Canada, Ltd.; Glaxo Wellcome Canada Inc.; Merck Frosst Canada Inc.; Novartis Pharma Canada Inc; Zeneca Pharma Inc.
Members of the Canadian Asthma Consensus Group: John C. Acres, MD, Moncton, NB; Tony R. Bai, MD, Vancouver, BC; Meyer S. Balter, MD, Toronto, Ont. ; Allan Becker, MD, Winnipeg, Man. ; Denis Berubé, MD, Montréal, Que. ; Robert Beveridge, MD, Saint John, NB; Jacques Bouchard, MD, La Malbaie, Que. ; Louis-Philippe Boulet, MD, Sainte-Foy, Que. ; Dennis M. Bowie, MD, Halifax, NS; William W. Busse, MD, Madison, Wisc. ; André Cartier, MD, Montréal, Que. ; Andrew J. Cave, MD, Edmonton, Alta. ; Moira Chan-Yeung, MD, Vancouver, BC; Kenneth R. Chapman, MD, Toronto, Ont. ; Victor Chernick, MD, Winnipeg, Man. ; Donald W. Cockcroft, MD, Saskatoon, Sask. ; Johanne Côté, MD, Sainte-Foy, Que. ; Robert L. Cowie, MD, Calgary, Alta. ; Anna Day, MD, Toronto, Ont. ; Mervyn M. Dean, MD, Corner Brook, Nfld. ; Myrna Dolovich, PEng, Hamilton, Ont. ; Denis Drouin, MD, Québec, Que. ; Francine Ducharme, MD, Montréal, Que. ; Nigel J. Duiguid, MD, St. John's, Nfld. ; Anthony D. D'Urzo, MD, Toronto, Ont. ; Gordon H. Dyck, MD, Steinback, Man. ; Pierre Ernst, MD, Montréal, Que. ; Alexander C. Ferguson, MD, Vancouver, BC; J. Mark Fitzgerald, MD, Vancouver, BC; Anton F. Grunfeld, MD, Vancouver, BC; Frederick E. Hargreave, MD, Hamilton, Ont. ; Richard V. Hodder, MD, Ottawa, Ont. ; John Hoey, MD, Ottawa, Ont. ; Daniel Hughes, MD, Halifax, NS; Robert H. Hyland, MD, Toronto, Ont. ; Robert Jin, MD, Ottawa, Ont. ; Alan Kaplan, MD, Richmond Hill, Ont. ; John Kolbe, MD, Auckland, N.Z. ; Thomas Kovesi, MD, Ottawa, Ont. ; Brent L. Kvern, MD, Winnipeg, Man. ; Eric S. Leith, MD, Oakville, Ont. ; Alex Leung, MD, Kamloops, BC; Ian B. MacLusky, MD, Toronto, Ont. ; Carina M. Majaesic, MD, Edmonton, Alta. ; S. F. Paul Man, MD, Edmonton, Alta. ; Francisco J. D. Noya, MD, Montréal, Que. ; Paul O'Byrne, MB, Hamilton, Ont. ; J. Grahame Owen, MD, Oakville, Ont. ; Sharon D. Peters, MD, St. John's, Nfld. ; Georges B. Rivard, MD, Sainte-Foy, Que. ; Michel-Y. Rouleau, MD, Québec, Que. ; Robert Schellenberg, MD, Vancouver, BC; Malcolm R. Sears, MB, Hamilton, Ont. ; Estelle R. Simons, MD, Winnipeg, Man. ; Arthur Slutsky, MD, Toronto, Ont. ; Sheldon Spier, MD, Calgary, Alta. ; Robert L. Thivierge, MD, Montréal, Que. ; John H. Toogood, MD, London, Ont. ; Michel Turgeon, MD, Sainte-Foy, Que. ; David W. Warren, MD, London, Ont. ; Sally E. Wenzel, MD, Denver, Col.; Barry Zimmerman, MD, Toronto, Ont. 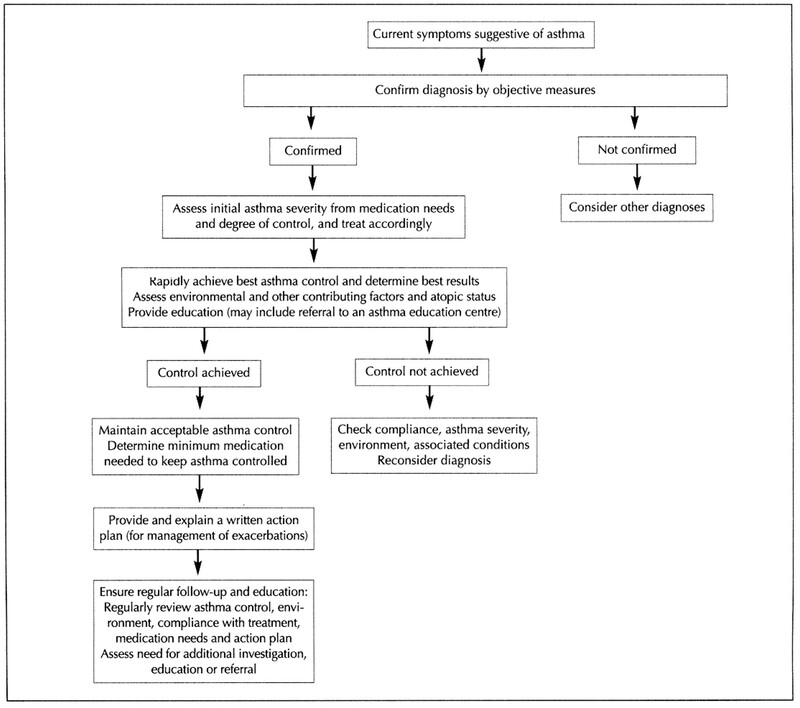 Determining asthma treatment by monitoring sputum cell counts: effect on exacerbations. Randomized Controlled Trials: Do They Have External Validity for Patients With Multiple Comorbidities?